It is a unique celebration in Poland, held only in the town of Jedlińsk. On the eve of Ash Wednesday, Death is publicly beheaded to mark the end of carnival time. I found a nice site about it. The custom was mentioned for the first time on the 22nd of February, 1860 at the Warsaw daily newspaper, in a letter of Jan Kloczkowski, the parish priest in Jedlinsk, who described the carnival spectacle. However, the origins of this custom are much earlier. 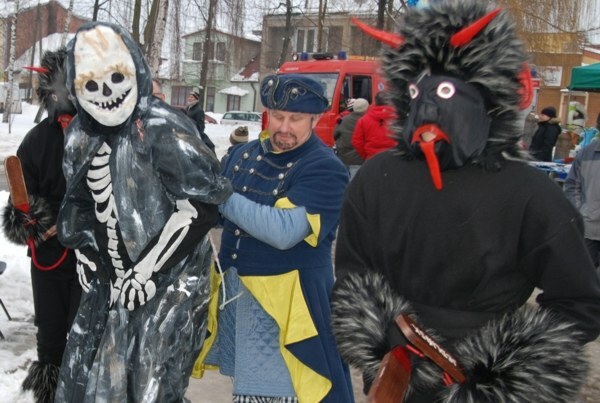 „Beheading of the Death” is a custom that ends carnival and winter as well. According to some theory the beginnings of the custom go to the sixteenth or seventeenth century, when effigies personifying winter were destroyed through their beheading, drowning or burning in different parts of Poland and Europe. 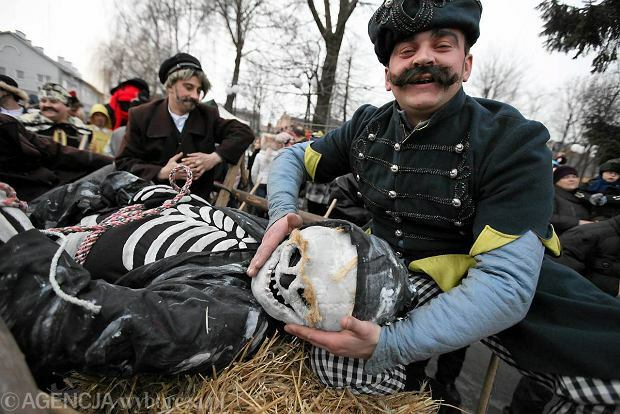 In comparison with the majority of Polish rites of carnival, „The Beheading of the Death” is the most theatrical. The main characters are: silent Death, executioner (headsman), mayor, town council (Jedlińsk, now a willage, used to be a town) and townspeople – citizens prosecuting Death, including Jew. These characters are involved in the main theatrical part of the custom. There are many supporting characters one may meet on the streets Jedlińska by the „meager” Tuesday: a Gypsy man, a Gypsy woman, a bride, little devils, policemen, a crone, a peasant, a devil woman, an angel etc. All the characters – even female – are played by men. Some of the roles and are played by the representatives of Jedlińsk families through generations.